For a number of reasons, which I won’t enumerate at the moment, I am seeking professional assistance with my brainpan. My brainpan, more specifically, the gray matter inside of it, hasn’t functioned properly for quite some time. If you look over to the right there -> and click on the tag “Brain FAIL”, you will see what I mean. The horribly gloomy, government-run, institutional, no other means available, ‘we will treat you because you have no other alternatives’ system is the last place you ever want to look for help. In the system is the last place anyone ever wants to be. The very nice man who indoctrinated me into the system even told me as much. He said, “If you have any other alternatives, you should use them, since this is a last resort.” I have no other alternatives. They designed the crazy department of the government (actually, most of the government in general) in such a way that you can never get exactly what you need when you need it. Some government bureaucrats, inordinately fond of paper trails and redundancy, decided that you must first go through the obstacle course. The obstacle course involves navigating your way through about a billion different government websites all with differing information. From the websites, you start making phone calls. You will spend approximately thirty hours on the phone, most of them on hold, trying to call various places. When you finally talk to a living person, they will give you the wrong information and send you to someone else. That someone else will say that they’re not the right person either or that their government building is too swamped and you’ll have to call another government building. Finally, when you’re just about to give up, the last government building you call gives you an appointment. Because the other government buildings are too swamped, you get an appointment at a place far, far away from where you actually live, even though there’s a similar place just down the street. The appointment is for the following month. The next month, you show up at the far, far away government building, go through the metal detectors, sit on a vinyl seat manufactured in 1953, fill out many forms with mostly the same information on each of them and wait. From there, they usher you into a conference room with other crazy people. The government indoctrinated, enrolled, oriented, entered, filed, processed, notarized, filled out in triplicate and bar coded several of my alternative-less fellow citizens and me into the system today. The crazy refugees included a woman who said nothing and looked at her shoes or the spot just in front of her shoes (I can’t be sure which) while playing with a paperclip for the entire three-hour process, a man who the court ordered to be there presumably after he was caught committing some crazy crime, a girl who was just released from the hospital since she tried to off herself and has so many different kinds of crazy that she can’t even list them all even though she tried to tell me about them non-stop, and a woman with such a case of the crazies that she lived in her own world for the entire time without once setting foot into ours. It seemed like a pleasant enough world from where I sat though. She was escorted by her mentally handicapped son. When the mentally handicapped are filling out your forms because you are too crazy to do it yourself, well, that’s a level of crazy I hope to never attain. Serious crazy is serious. And then there was me. 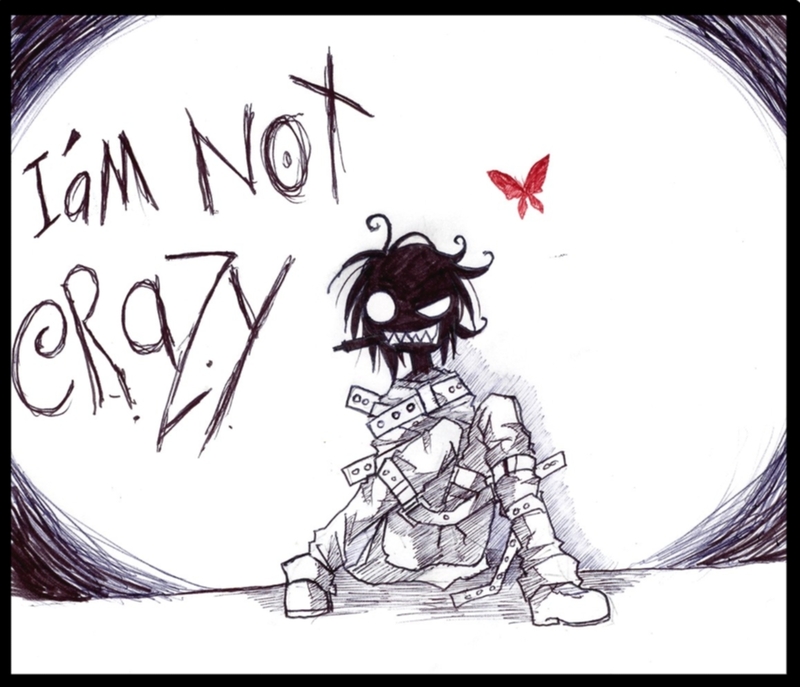 In the room with the crazy people, they lecture you like you are five years old, and frankly, crazy. Given the condition of my fellow inhabitants of the room, I can’t say as I entirely blame the nice government workers for adopting this attitude. After the three-hour orientation, you sit in another room with another person and they ask you the very same questions that you have already answered on the many forms you filled out when you arrived. Either they lost all your forms in the meantime or they assume you were too non compos mentis to fill out forms properly. In the case of the crazy lady who brought her own world with her, I can see how they would arrive at that conclusion, but then why ask the crazy to fill out forms in the first place? From there, you are gloriously escorted out of the building with some reading material printed on purple paper with a smiley face on the cover and a slip of paper that says come back in three months. That puts us in December. And the appointment in December isn’t even for what you need. It is just another hurdle where, more than likely, the same forms will be filled out, the same questions will be answered, and the same vintage, vinyl chair will serve as a receptacle for your buttocks for longer than you’d think entirely necessary or even possible. Now, I know I’m not the sanest person around, but I’d like to think that I can handle my business, even with a malfunctioning brain. I can hold a job and live in a house, fill out forms, and tie my own shoes. I am not a danger to myself, other people nor small woodland creatures. I don’t hear voices in my head that tell me to visit the planet Neptune and kill all the Neptunians because they can read my thoughts. I don’t think that I’m Joan of Arc nor Betsy Ross. I know what year it is. I’ve never made a tinfoil hat. However, somehow, this strange thing called life, has set me on the same path in the same room on the same side of the table with the criminally and/or just plain old insane. And worst of all, I have to go back there… in December. Basically, all I accomplished today was to verify that the government is, indeed, a ridiculous organization and that I’m not as crazy as I thought. There are people much crazier than I am and I’d like to keep it that way. I suppose that was worth the trip. The crazy saga continues in the post In The Middle. Posted in mental illness, on being..., serious business and tagged anxiety, bureaucracy, Depression, government, mental health, PTSD. Bookmark the permalink. On reading this I’m struck by how well it’s written, particularly if you were experiencing difficulties with memory or cognitive thought at the time. You also managed to make some funny observations in the midst of what sounds like a demoralising experience! I didn’t realise that making a tin hat was a definitive sign of mental illness but I’ll look out for it from now on.